For those of you who have followed my blog you know how I love to pimp my games, and use games in an educational setting. During the centennial of WW1 I have been looking for a game to use with my Civil Air Patrol cadets' aerospace education classes. While there are many excellent games covering dog fighting (Canvas Eagles, Blue Max, Richtofen's War, Dawn Patrol for example), I wanted something more than just a combat game. As with my adaptation of London's Burning, I was looking for a game that would cover more history, allow the cadets to use leadership and teamwork skills, and engage the entire squadron. Luckily I discovered Berserker Games and Erik von Rossing's excellent Aces of Valor. As I have said in the past solo games are often easier to adapt to classroom use than many games designed for multi-players. I knew that Aces of Valor would serve the job perfectly; plus it is also lot of fun solo (I've been enjoying it for the past several months.) As a Print and Play game the price is also right. What Aces of Valor gives me is an excellent campaign setting for a WW1 squadron to fly a number of missions in. It does have a very good combat system for solo play, but what I want for my cadet is a way to manage a squadron, setting the stage for aerial battles using a Canvas Eagles type game. Basically the plan is for the cadet squadron commander to choose the mission (from the Aces of Valor mission cards), and assign the pilots. 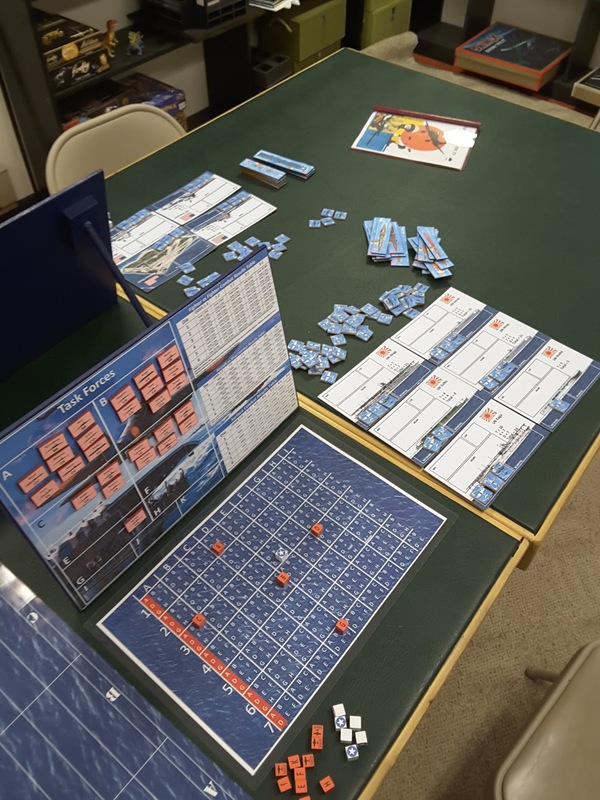 The flight leader for the mission will move the squadron marker across the board, again using the Aces of Valor rules, and encountering events. 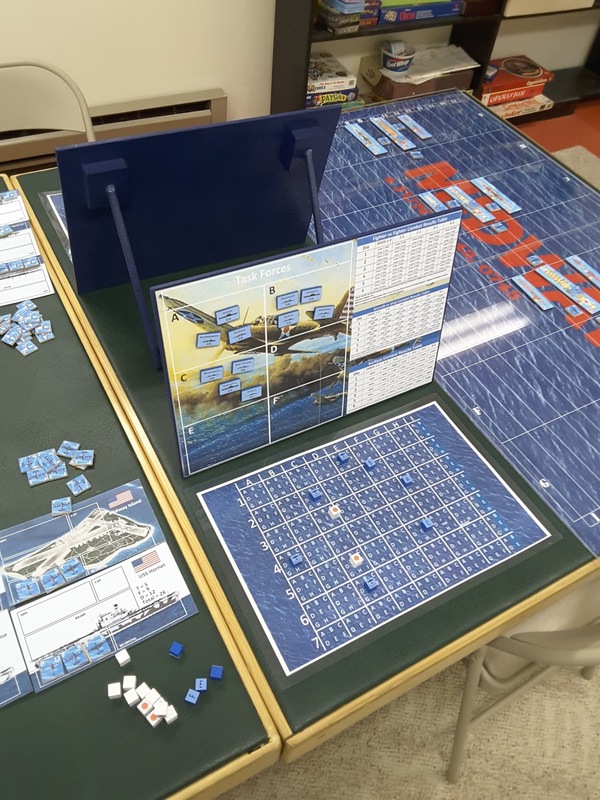 Weather, flak, and damaged aircraft are handles very well with the Aces of Valor rules; but when the squadron encounters enemy aircraft or ground targets play will move to a large scale board. There each cadet who is part of the mission will handle their own aircraft using Canvas Eagle/Blue Max based rules. The system of play and rules has not been finalized yet, but it is getting close. The beauty of using Aces of Valor is that any air combat game can be used to handle the dog fighting phase: Wings of Glory could easily work. While the games comes with perfectly usable components (in fact the graphics have recently undergone an upgrade), I wanted something more. So for the past few months I have been building a roughly 1/1000 scale version of the print & play board. The base is 1/4" MDF board with felt backing; with Cellfoam 88 glued on for hills and no-mans land. The entire surface was covered with glue and fine sand, then painted with craft paints followed with a little dry brushing (at that scale simple is best.) For most of the structures I used Brigade Models Small Scale Scenery line, (the ruins are Oddzial Osmy terrain - slightly larger scale, but still works). The railroads from Brigade Games are excellent. The oil depots are scratch built, and the hangers are really, really reduced paper miniatures from Fiddlers Green. The aircraft at the airfields are from Brigade Games Aeronef line, while the observation balloons came from Classic Airships at Shapeways. The AA batteries are made by Tumbling Dice; again 1/600 scale, but close enough. I finished the boards off by gluing Woodland Scenic's shrubs for forests. To mark the squadron's base and the mission targets I used Litko objective and HQ markers. The squadron marker to move over the board is a Litko Fleet Movement Stand with 6" legs. I painted 1/600 scale aircraft (Tumbling dice and PicoArmor) to match the 1/72 scale plane that will be used for the dog fights. Hopefully I will be able to take these boards to conventions in the future and link up with some air combat games so they get used more than a few times a year. Back in the late 1990's (I think it was 1999), I had the pleasure of meeting Evan Jones (the designer of Blue vs. Gray), and his partner from QED Games at Origins. They were there to demo and release Blue vs. Gray, and as the owner of an educational game store I was very intrigued. Blue vs. Gray was the perfect game to add to our Civil War games line-up with its wealth of history on every card and its focus on personalities, events, and grand strategy rather than combat. Over then next few years we sold many copies to schools and educators, as well as gamers. I also had the satisfaction of winning Blue vs. Gray Origins' tournament the following year; the final game being against a Civil War history professor from a college in Virginia. With the closing of our store the game sat on my shelf for a number of years until I started playing it with a fellow fan at the local game club. I realized it would benefit from a deluxe treatment. So last year I pimped Blue vs. Gray out. It didn't really take as much work as some of my other games since it really is only two decks of cards. What it needed was a larger board rather than the one made out of cards. So I scanned the map cards and enlarged them to 10" X 13 1/2", mounted them on chip board, and lamented them. Now when a map card is drawn, a large card is placed down. I also made a version of the play mat from the GMT deluxe version of the game, and made new control makers on 1" wooden disks. It also needed a larger box. While the large cards are not quite as colorful as the original cards, the big map is very satisfying to play on. You can get copies of the cards in a PDF file. Just have them printed on 11" X 17" stock. Map Cards. Last evening my Civil Air Patrol squadron had its weekly meeting. As the aerospace education officer it was my night to have the program. The plan had been to work on astronomy and celestial navigation, but it being Northeast Ohio the weather didn't cooperate, as usual. Luckily I had a back up lesson - air racing. Air racing played an important roll in the development of the air plane, and since we are close to Cleveland, air racing is a part of our local history too. Naturally I thought a game would be a good addition to the lecture. Luckily I have a copy of Golden Age Air Racing by Dave Schueler from from the Air-Pirates Yahoo group. I had an idea that I would be using the game for a class in the future, but two weeks ago having realized that it would be a full moon and March, I had better have a fall back lesson ready. So I raced to JoAnn Fabrics for a piece of green canvas for a play mat, slapped some paint on for background and used my 4" hex template for spaces. I found some paper pylon patterns and a Bendix tower at Fiddler's Green. The bleachers I modified from a paper model for slot car racing (I thought more era appropriate advertiser signs would look better). The stands for the planes are 2" hex tiles from Lowe's turned upside down for texture and painted with acrylics. The planes I designed from various 1930's air racer schematics I found and made them into approximately 1/144 scale 2.5D paper models. I also designed record sheets that would allow my cadets to learn the game quicker. A big help and inspiration was from Kevin Smyth's Air Racing at Enfilade article on his A Gamer's Tale blog. He was also very helpful in answering my questions I had about his game. It was a success. With the wind and snow pelting the hanger it was a fun evening of racing planes and learning about the history of air racing (I like to teach as the game is progressing.) I even had airplane trophies I had found at Oriental Trading Company that I relabeled for the winners. 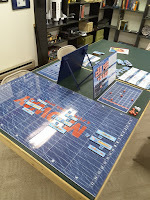 One of my long time gaming goals has been to make a deluxe version of Avalon Hill's Advanced Civilization similar to my treatment of Victory in the Pacific and LiftOff!. I received the original Civilization as a Christmas present back in the early 1980's, and then got the western expansion board and commodity cards through the General. I knew I wanted a larger board in something other than day glow 1980's colors, and larger cards in better quality than the cheap punch-out paper civilization cards of the original game and the small commodity cards. I also wanted the board to be one piece rather than a original mounted board with the paper western expansion add-on. As I began to start the design process I discovered a thread of posts on Board Game Geek by Evan Derrick on his redesigned Civilization project. Not only was he almost finished with it, but he is an actual artist/graphic designer. So rather than reinvent the wheel, so to speak, I made use of his excellent work. (You can find them on Board Game Geek in the Advanced Civilization files.) The only changes I made were to resize the Civilization cards to tarot-size rather than poker-size, and to enlarge his board to match the size of my other updated games. My game group has really enjoyed playing Civilization; many of my game group's younger players for the first time. This past years we've had it out a number of times - more than we've played it over the past 20 years. I see that it has been over a year since I last made a new post to this blog. While I had such good intentions of working last winter on catching up on my backlog of post that I wanted to share on my gaming life once again got in the way. Last January I became the Aerospace Education Officer (AEO) for the local Civil Air Patrol squadron. From high school through my college years I was a member of CAP both as a cadet (for those of you who know about CAP I received both the Mitchell and Earhart awards), and then a senior member. For I number of years now I have been an Aerospace Education Member, but when the local squadron changed their meeting nights I was able to attend. I found that they needed an AEO, and with my background in CAP, science and education they were excited to have me. So instead of spending 2017 gaming I worked on lesson plans, building science equipment, and teaching classes on rocketry, hydraulics, astronomy, and aviation. It's been a lot of fun; I have a large group (31 cadets currently), of very intelligent, well behaved cadets who are interested in learning what I am teaching. Certainly different than teaching in the public schools - more like homeschooling my daughter, Maggie Reitz-Wells. Of course I have had the chance to use games in the program. This past summer I built a simulation of the Battle of Britain. I started with Avalon Hill's classic London Burning. While this is primarily a solo game, I have found that solo games are easier to adapt to large groups than a game designed for multiple players. By the time I was done the game was able to accommodate 28 players. The game is composed of two parts, a strategic board of southern Britain (based on the original AH board), with 2-inch hexes, and a tactical air combat board with 4-inch hexes. The boards are of felt with features painted on, and defensive installations (Chain Home stations, AA emplacements and barrage balloons), made of paper for a 3D effect. The aircraft are also paper models of Spitfires, Hurricanes, ME 109's, and HE 111's. Each side was commanded by an air marshal. The German air marshal's task was to pick the bombing targets and assign aircraft for each mission - a mix of bombers and fighters. He then handed the target selection over to his navigation officer who plotted the course, being careful to avoid AA batteries and keep the flight as short as possible. The British air marshal decided which of his squadrons would be on patrol or standby and at which airbase. The British defense minister controlled the placement of defensive installations and handle the budget for repairs of civilian targets and aircraft. The British defenses where composed of six squadrons. Each squadron was commanded by a cadet who's job was to intercept the attacking German aircraft. One released by their air marshal they needed to plot their intercept course, decide if they would wait for support, and then whether they would attack bombers or fighters. The German pilots represented both bombers and fighters. The cadets controlling the bombers needed to decide their formation to best defend each other, while the fighter pilots needed to decide if they would intercept fighters or defend bombers. I began the evening with a brief overview of the Battle of Britain, but used situations during the simulation to point out actual historical events. It made the lesson much more fun. As it so happened this class occurred on the night before the release of Dunkirk; a nice tie-in. While I may not have been doing a lot of gaming this past year, I was keeping busy. I had a number of game related projects to keep me busy during last winter through early spring. One was to reduce my huge collection of games to a more manageable size; between giving games to family and friends, donating and selling, I am down to about a quarter of what it was last January. Another goal was to refrain from purchasing any new games with the exception of expansions to games I really enjoy and already own (not an easy goal, but one I was able accomplish in-spite of attending Origins.) Finally I looked at the games I really love and chose ones I thought needed a make-over like I had previously done with Victory In the Pacific, and Liftoff!. One of the games that fell into this category was Avalon Hill's classic Midway. When I start redoing a game I try to keep the enlarged board to the same size as my other redone games. That way they fit on my game table and I can use the Plexiglas sheets I already have. So the battle board is 24" X 48". The spaces on the board were made so that I could use Topside Minis wonderful full color wooden ship counters.The only problem is that two of the ships for the Japanese force weren't part of their ship collection, but after contacting them about the project Topside quickly produced them for me. The search boards are 11" X 17" and laminated. The spaces are 1/2" inch squares - much like the original game. Rather than have counters the same size as the originals with the difficulty of reading them and picking them up on the board, I went with 1/2" cubes for tasks forces. So now instead of placing a stack on ships on a square of the search board, they are grouped by task forces - only one counter is moved. Shielding each search board is a task force board. 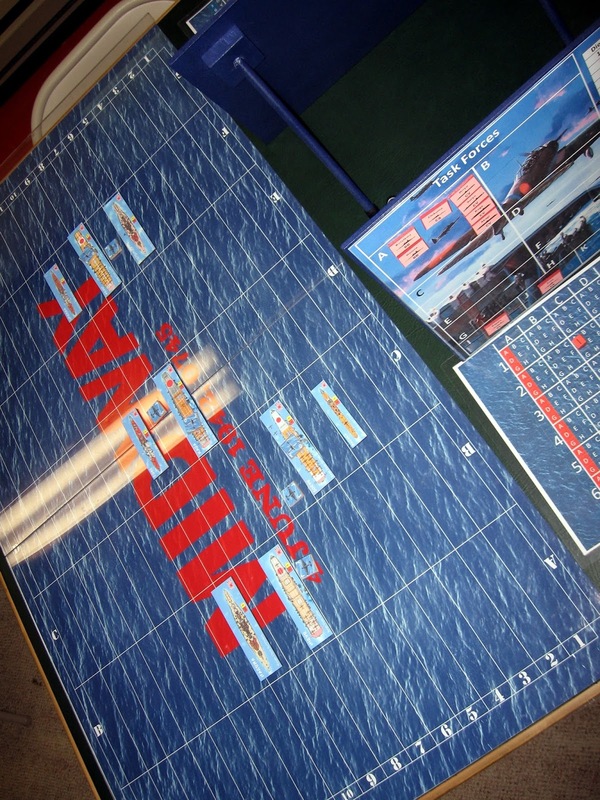 The tasks force boards are metal sheeting covered with laminated artwork. A number of task force boxes and handy game tables are on them. Wooden counter with magnets on the back represent each ship in the game. The metal sheets are mounted on wood with removable legs for storage. For the aircraft I made cards for each aircraft carrier (again laminated). The aircraft markers are 1" wooden squares. Easy to move around the ship cards to show their ready conditions, and then placed on the battle board for combat. In addition I made a pad of record sheets, a storage box for counters, reprinted the rules, and made a custom game box. Sorry to all of you who have been looking for this blog over the past year. I know a lot of you have been trying to contact me through various means including Boardgamegeek. Due to family difficulties which are of no importance or concern to anyone - certainly not on a blog - I took the blog down. But now it is back up, so the various gaming files are once again available. 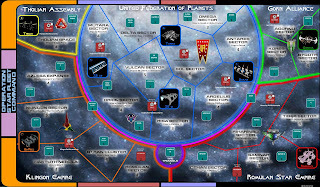 For those of you who have been asking about my Operation: Starfleet Command game; yes it is still a work in progress. Here is the link to my latest version of the board. I have combined the construction area of the Battleboard with the main game board by moving the space docks to it. I am working on a new Battleboard which will be smaller than the original. I'll post it as soon as I have it ready. 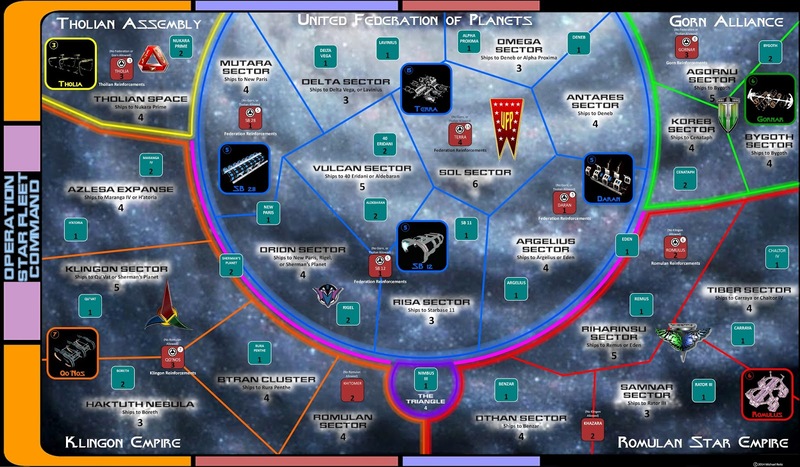 For those new to the game, you can find the rules, counters, and extras under the label Operation Star Fleet Command.